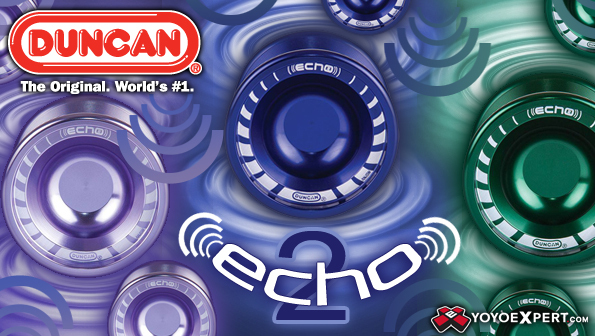 Adding to the De-Luxxe series of high performance aluminum yo-yos, Duncan is proud to release the new precision machined Echo 2 yo-yo. The Echo 2 holds its own with a new V-Shaped profile and a licensed Dif-E-Yo KonKave. These changes both help to smooth out string catches and improve the overall weight distribution for added stability. This new version of the Echo also features nicely machined grooves on the body of the yo-yo reducing the amount of friction and increasing the success of performing grinds. These features allow today's most difficult tricks to be performed on a yo-yo all with an extremely affordable price tag. Available in six brilliant anodized finishes!